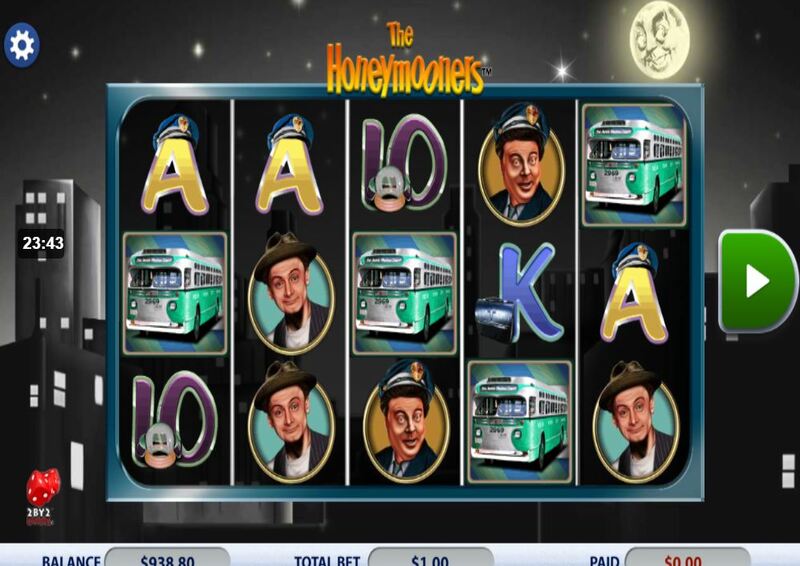 The Honeymooners slot is a themed slot based on the 1950's American sitcom of the same name. Ralph Kramden, the lead character in the show, played a bus driver for the fictional Gotham Bus Company in Brooklyn NY accompanied by his long-suffering wife Alice and friend Ed Norton. The tempestuous two's troubles and bickering was actually the inspiration for the cartoon characters Fred and Wilma Flinstone, so have slot developer 2by2 Gaming made the game as volatile as the characters? 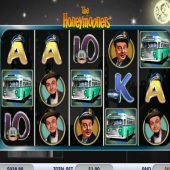 You are greeted by the 1950's Jazz music that was the score for the show and the reels are laid over the monochrome Brooklyn skyline featured in The Honeymooner's TV introduction. The standard format of 5 reels and 3 rows contains 20 pay lines with the game's logo forming a stacked Wild on reels 1, 3 and 5 and the top-pay of 50x bet for 5-of-a-kind, although you won't see 5 in the base game! Ralph and Alice are the top standard icons at 25x bet for 5 followed by Ed at 20x. The remaining symbols are the cafe, bus and card values paying 7.5 down to 2.5x bet but unlike the Wilds they all appear only stacked one or two rows high. There are 7 bonuses available, two of which are free games and 5 are various single-spin features. The free games are triggered by pink bonus scatters on the centre 3 reels and the spin features arrive via two old 1950's TV sets in wooden cabinets on reels 2 and 4 which randomly pick one of the five. Funny Money - a random amount of Dollar Bills start flying out of the TV creating a win meter with a pile of cash. Hello Ball - a golf ball rolls over the reels and lands on one making it Wild, then the rest spin once hopefully creating a decent win. Get Rich Quick - Poor Ralph often tried but never succeeded but in this case you pick one of 4 helper icons to reveal cash for him! Will of Fortune - all TV symbols become 3x Wilds and the reels all respin once. Should you get a win with both TV's on 2 and 4 the win is multiplied 9x. Floating Wilds - the reels all respin and a number of Wilds float onto the grid before pays are evaluated. If you see the 3 pink scatters on reels 2, 3 and 4 you are given the choice of 2 free spins rounds. You can opt for Wild Alice spins and will get 10 games but with Alice acting as an extra Wild or choose 8 Wild Multiplier spins with 2x, 3x and 4x Wilds on reels 2, 3 and 4 respectively. These Wilds will cumulatively multiply too thus making 24x on 4 or 5-reel wins possible! Neither option can be retriggered but both can be quite rewarding.